JOANNE MARIE BUTLER, 77, of Uhrichsville, OH, passed away on Monday, January 30, 2012. She was born on February 28, 1934 in Goshen, Ohio. She was the daughter of the late Arthur D. and Nora (Page) Garrett. The Garretts resided behind the Universal Sewer Pipe Plant #2 on a lane that included the Kopp and Casebeer families. She was married to Robert D. Butler, who survives. Butler had been a waitress in many of the local restaurants and loved to crochet, sew and fish in her spare time. Butler has a sister Dorothy Dyer (husband Wayne) of Port Washington and three brothers, who preceeded her in death, Kenneth, Donald and Junior Garrett. Butler’s complete obit appeared in the Times Reporter on January 31, 2012. Invitation to stop through Jan 1, 6-9pm and enjoy the Page Family Christmas display. I am engaged to their oldest son, Shane. We have 2 children, Mitchell, 13 and Brayden, 6. Jim has passed down the enjoyment of putting out the Christmas display to his sons, and now our children. It’s a family affair. Our children enjoy telling everyone they come in contact with about the Christmas display and love watching children’s faces glow when they turn off of 416 onto Goshen Valley Rd. We add to the display 30-40 new items every year. We recently purchased a Winnie the Pooh from 1977, which brought Shane to tears. It was the very first blowmold his father bought for him, which was lost in the house fire. We also purchased 3 lanterns, a white, red and green, that were used in small towns 50 years ago. Each and every blowmold has a story behind it, with most of them being vintage. We invite you to stop by through Jan 1, 6-9pm and enjoy the Christmas display we have. 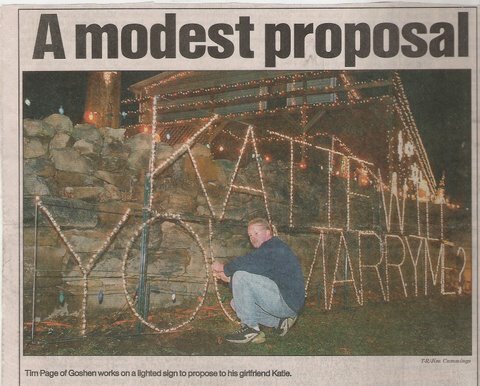 Tim Page proposing to his girlfriend Katie. 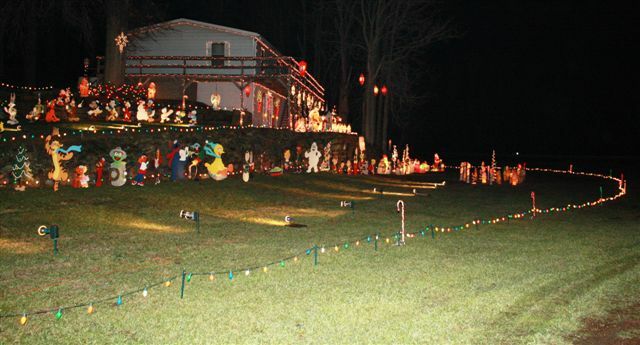 The Jim and Marilyn Page family have been putting up their large Christmas display for more than 30 years and Marilyn says they still get a huge response. Marilyn added that they used to run a train outside as part of the display but also discontinued that ritual after the fire. 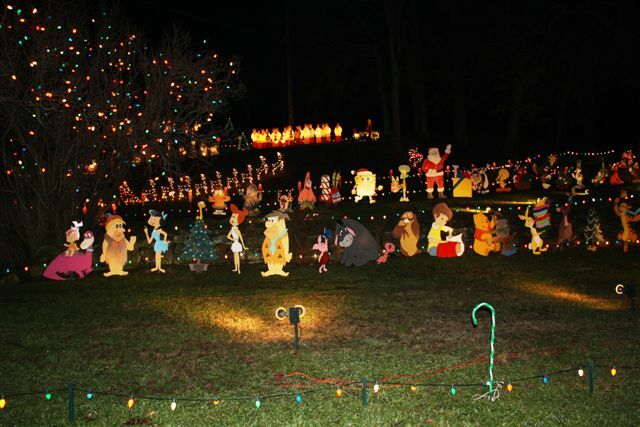 The display, which is one of the largest in the county with a myriad of lights and hand painted cartoon figures has caught the attention of the local newspaper more than once. There was another photo of the family and their display when twin sons, Matt and Tim were small. “We were holding them in the photo,” she said. On Christmas Eve, of 2002, Tim decided to propose to his then girfriend of 5 yeras, Katie Johnson. With a lot of help and planning a 6′ by 26′ sign was created and placed amongst the holiday sparkle and painted characters. While they stood outside admiring Tim’s handiwork, a car drove by and stopped. A man they didn’t know rolled down his car window and yelled, “Did she say yes?” The couple confirmed that she had. Tim explained during an interview with the T-R that Katie had told him previously that when he asked her to marry him that he had better do it in a way that means something to him. 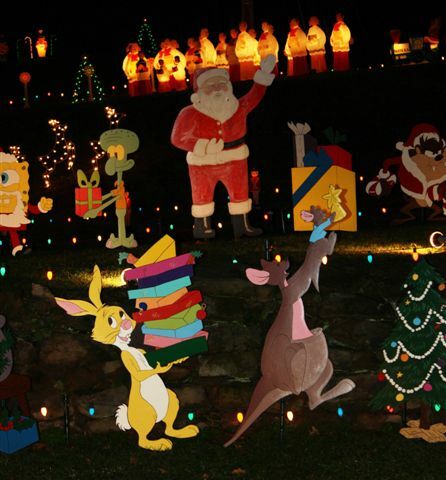 “And as you can see, Christmas lights have always been special around here,” he said, looking around. The couple were married on June 19, of 2004 and have a daughter Matilyn Elizabeth. They reside in Tuscarawas. 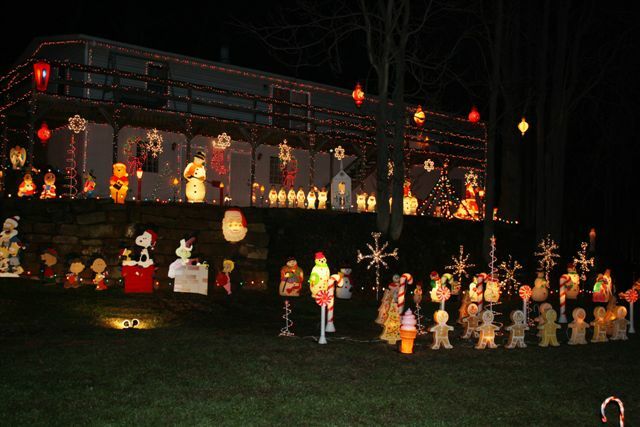 The family continues to put up and improve the display that sits along Goshen Valley Dr. and State Route 416 each year about this time. It wouldn’t be Christmas in Goshen without it! Marilyn and her husband, Jim Page, have lived in the home along 416 since their marriage in 1972. The home was destroyed by fire and a new home was constructed on the site. The Pages have three sons, Shane, Matt and Tim, all of Tuscarawas. 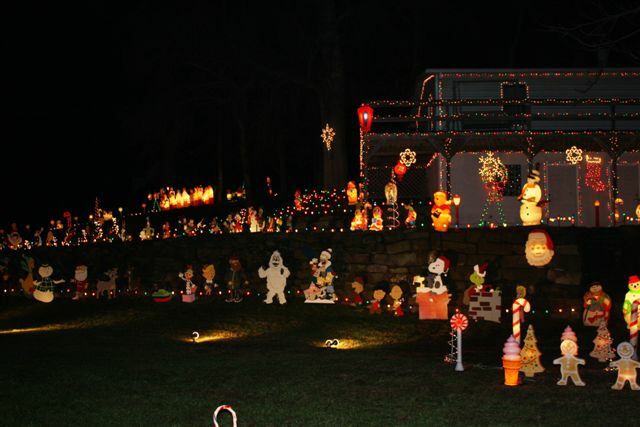 The home gets a lot of attention during the Christmas holiday as it has one of the largest light displays in the county. 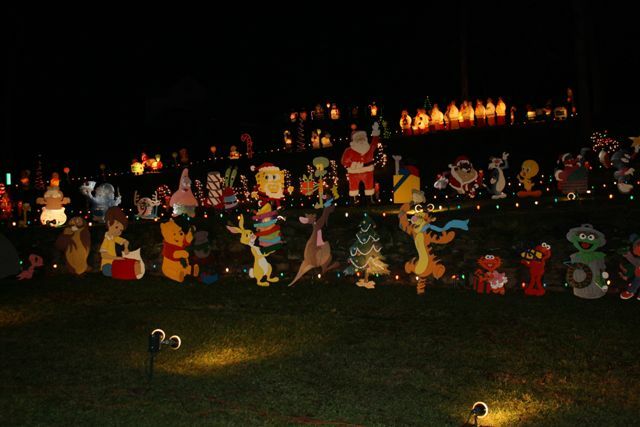 It features thousands of lights and handmade cartoon characters. Marilyn noted that their current driveway was a part of the old road (later Rt. 16 and 416) that went through Goshen.